Edited 2 time(s). Last edit at 2014-04-02 14:02 by bv. Almos all confirmed, except Madrid. Should we worry? Thanks! ¡ Va a ser la repera amigos....! This time Santiago Bernabeu, not Calderón. It looks like it's confirmed. 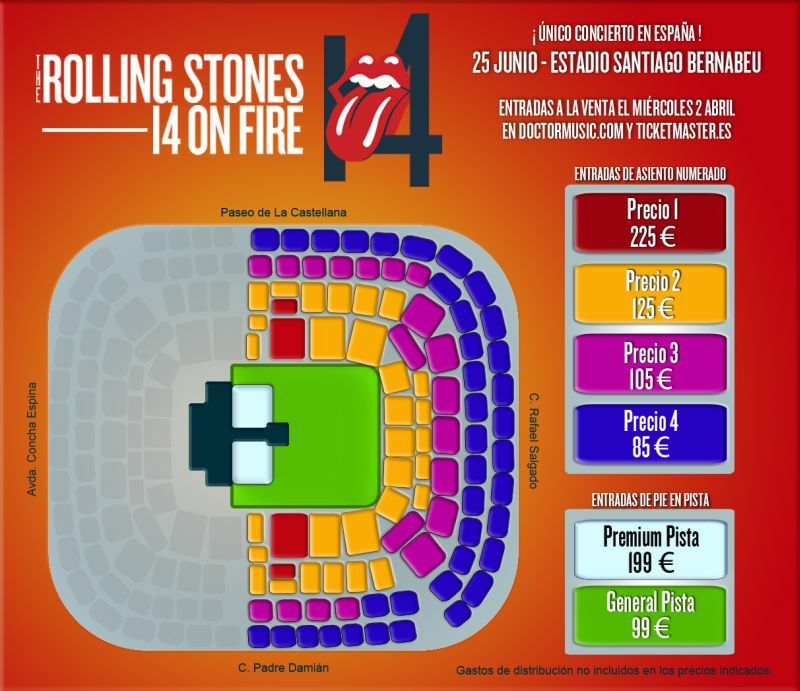 Consigue tus entradas para el concierto de The Rolling Stones - 14 On Fire Tour del 25 de junio en Madrid. Los rumores sobre la gira de The Rolling Stones empezaron a correr hace ya algunos días, y ha llegado el momento de confirmar oficialmente su regreso a España. The Rolling Stones vuelven en 2014 con un único concierto en nuestro país como parte de su 14 ON FIRE tour, la fecha, el 25 de junio en el Estadio Santiago Bernabéu de Madrid. Las entradas para el show más esperado del próximo verano se pondrán a la venta a partir de las 10:00h del miércoles 2 de abril. El precio de las entradas será de 85€, 105€, 125€ y 225€ para las entradas de asiento reservado y 99€ para las entradas de pista. También habrá disponibles entradas de Pista Premium a un precio de 199€ (gastos de distribución no incluidos). Entradas a la venta el miércoles, 2 de abril. I think with this layout it is more like 60.000 capacity. Will Call up to 72 hrs before the show. Yes, finally in S Bernabéu. More capacity but would have preferred the Calderón. Anyway, the good thing is they will come to Madrid. See you there. 199€ for the Standing Premium. This won't be 80.000 capacity. In case of a footballgame it holds 81.044 (http://www.realmadrid.com/en/santiago-bernabeu-stadium). At the seatingplan the stadium is divided approx. 52/48. So that will be 42.000. Then on the field a 5.000-7.000. Total of max. 49.000. Edited 1 time(s). Last edit at 2014-03-25 16:56 by skyhawk. It shouldn´t be a problem between fans.... mate!! If i get a ticket I´ll go to Oslo, so, if interested I could take a ticket for you and give you it in hand!!! Looking forward to coming to Madrid, if Mick Taylor's there, of course. Don't jinx it! Correct me if I'm wrong but are you the IORR member who went to the only show on the 50th Tour where Taylor didn't play? Springsteen's 2012 show was reported as a sell-out, with 54.639 sold tickets. Stones promo in Madrid 2014. Could someone please confirm the website that will sell these tickets? Thanks in advance. I'm going to go out on a limb and buy tickets for this and HOPE that I can get vacation then and go to Spain. Edited 1 time(s). Last edit at 2014-03-26 03:11 by rbarnes00. Another rip off. How can they justify 40 euros delivery. If you want to pick tix up you gotta do it only up to 3 days before the show. Some of us will only get to Madrid the day before or even on the day. @Carlitos: I was talking about Springsteen's 2012 Bernabeu show...anyway, his 2008 show there sold 53,783 tickets (55,000 were put on sale). I was there. Really good concert. They sold around 55.000 tickets but it was not 100% full and was very confortable to be in the standing area with bars in the side easy to reach where I spent the whole concert. I fly out to Murcia the day before and now trying to persuade the Mrs for us to either drive or catch the train to Madrid.